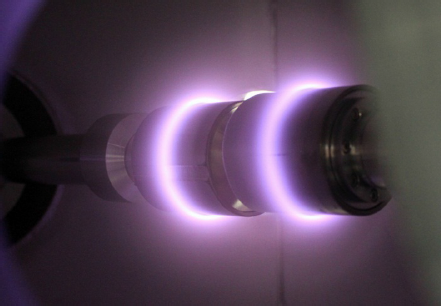 We operate several vacuum chambers for the deposition of thin films, ion implantation, and custom plasma-based technologies. 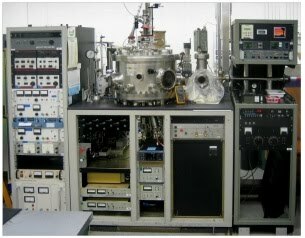 While emphasis is on process development and materials synthesis, we also operate equipment for materials characterization, especially for thin films. 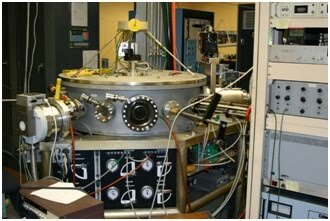 A universal research and development deposition system primarily for advanced magnetron sputtering including High Power Impulse Magnetron Sputtering (HiPIMS). This chamber is equipped with industry-standard mass flow controllers for multiple gas injection, residual gas analyzer (SRS) and Hiden EQP Mass and Energy Analyzer for Plasma Diagnostics. The chamber has a motorized substrate holder capable of rotating the substrate to various positions. Planar magnetrons from 1.5” to 3” and 2 linear magnetrons with target size 178 mm x 38 mm are available. Rotating substrate holder capable of multilayer deposition using multiple sputtering. Various sputtering guns for different size target. Substrate heating up to 500°C. (Left) HiPIMS without any gas: Pure Self-Sputtering of Cu in vacuum. A research and development chamber primarily used for cathodic arc deposition (both continuous and pulsed). It is also the system for depositing thin films of zinc oxide and related materials. Substrate treatment such as biasing and substrate heating up to 500°C are possible. This chamber has a residual gas analyzer (RGA by SRS) and a Raytek IR temperature sensor to monitor the substrate temperature. Industry-standard mass flow controllers are used and in conjunction with the RGA, a feedback loop controlled by LabView™ allows the gas pressure and flow rate to be regulated during deposition to ensure consistent partial pressure during deposition. Typical base pressure is 2.0 x 10-6 Torr; the cryo-pump has a custom cool trap for zinc vapors. The pressure and flow of gas is regulated by LabView™ to maintain control of partial pressures during deposition. LabView control of the sequence of up to three cathodes during pulsed cathodic arc deposition. Substrate biasing and heating up to 500°C. (Left) Transparent conducting aluminum zinc oxide thin film deposited on glass. 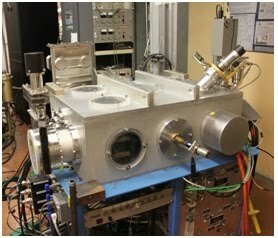 A research and development deposition system primarily for advanced magnetron sputtering including High Power Impulse Magnetron Sputtering (HiPIMS) in SRF cavities. 1.3 GHz cavities with niobium using the HIPIMS process. IBEX is a physical vapor deposition chamber, capable of binary and ternary sputtering. It has ports to house up to eight round sputter sources which are grouped in four clusters on the chamber floor. The planetary substrate holder allows for film uniformity over 73 mm x 73 mm for multilayer devices or 89 mm x 89 mm for single layer. Substrate masking and combinatorial synthesis capabilities are also possible. 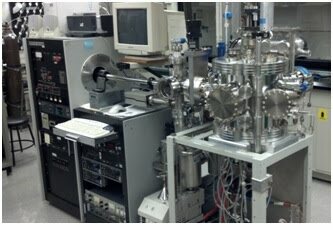 This system can operate in single and dual magnetron reactive deposition mode, with industry-standard dual magnetron and mid-frequency sputtering supplies (Advanced Energy), industry-standard mass flow controllers (MKS), differentially pumped partial pressure analyzers (SRS), and a custom load lock and glass sample cleaning station. Typical base pressure is 1.0 x 10-7 Torr. Assortment of DC, 40 kHz, RF power supplies. Load lock maximum possible passage size is 96 mm. Substrate maximum size without masks = 89 mm square; 87 mm x 89 mm coated. Substrate maximum size with cartridge-mask system is 73 mm square, 66 mm square coated. Cartridge-mask system allows multiple deposited layers without breaking vacuum. Absolute maximum rotated sample size is 150 mm square. Substrate heating could be added with non-rotating carousel. (a) Planetary substrate holder, (b) Substrate masks (c) Multiple sputtering sources on the chamber floor as seen from the top of the opened chamber. This chamber is equipped with a Terminated Gas Condensation source that allows deposition of nanoparticles with a very narrow distribution of sizes. Metal and metal oxide nanoparticles can be fabricated. Terminated Gas Condensation source. The sputtered atoms enter the high pressure condensation zone where their mean free path becomes very small and they quickly thermalise. Nanoparticles are formed as these thermalised atoms migrate towards the expansion zone. Adapted from Mantis Deposition LTD.
PVD 2 is a physical vapor deposition chamber, capable of binary and ternary sputtering. It has ports to house up to three round sputter sources. Substrate masking and combinatorial synthesis capabilities are also possible. This system can operate in single and dual magnetron reactive deposition mode, with industry-standard dual magnetron and mid-frequency sputtering supplies (Advanced Energy), industry-standard mass flow controllers (MKS), differentially pumped partial pressure analyzers (SRS), and a custom load lock and glass sample cleaning station. Typical base pressure is 1.0 x 10-8 Torr and can be easily retrofitted to achieve ultra-high vacuum. Assortment of DC, 40 kHz, RF power supplies. Load lock allows samples interchange without contaminating the main chamber. Substrate heating could be added. Currently used to deposit transparent conducting oxides such as ITO.